San Sebastian is in the northeast of Spain, which is known as Basque Country and has its own language and culture. While Spain was under the fascist rule of Franco, learning Basque was illegal, but Franco is gone, and the Basques are going strong. When I met Oscar's surf teacher and repeated his name to him, "Miguel", he corrected me and said, "No, Mikel. With a K. It is the Basque version of 'Miguel.'" Then he hit his chest and said proudly, "I am Basque!" I can't understand Basque at all, although I've learned how to say good bye - not terribly useful. Luckily, everyone here also speaks Spanish. 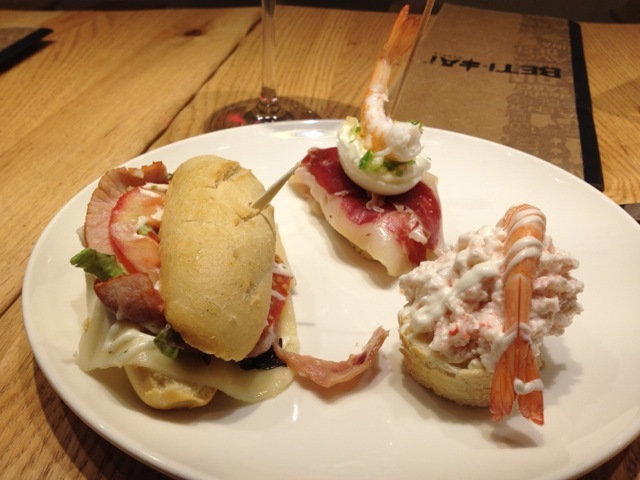 Truly, my favorite part of San Sebastian is the pintxo culture. I find most things here expensive with our poor exchange rate, but the pintxos are still a pretty good deal, cheaper than buying food and cooking. On Thursday nights, many of the local restaurants run a special with a pintxo and a drink for two euros. Henry Higgins had it almost right when he said "The rain in Spain stays mainly in the plains." It's more like, "The rain in Spain stays mainly in San Sebastian." But I suppose that would not have helped Eliza's diction. I knew that San Sebastian would be cooler than one's typical summer holiday, but good lord, I am COLD. It's been mostly in the 60s but the wind is impressive, and we've had a lot of rain. When I look at the average temps and rain for July in this town, it seems it should be much more comfortable than it is. This is just one reason why the camp is so great. The kids are having fun with the other kids no matter what. This weekend during a sunny afternoon, we went to this retro 100-year-old amusement park on Mount Igeldo overlooking the ocean. It is completely old-school and reminded me of state fairs from my childhood, complete with a fun house and not a seat belt or harness to be found. To reach it, you take a funicular up the cliff. The kids loved it. Across the bay, on the other side of La Concha beach, is Monte Urgull, a big hill/small mountain that is easy to climb and affords amazing views. At the top, there is a battery. Part of it dates to the 17th century, but parts of it are newer from the time of the Napoleonic Wars. There are canons still up there with a small museum at the top. Of course, on top of it all is a large statue of Jesus who overlooks all of San Sebastian. The juxtaposition of weaponry and religion never fails to amuse me. I’ve also found a place called La Perla, a century-old thalassa spa that’s right on the beach with views of the ocean from the indoor pools. A friend and I are going tomorrow for massages and two hours of luxuriating in pools and hot tubs. It will be especially great to be at the beach looking at the ocean but from the comfort of warm indoors, given the weather. We slipped out of San Sebastian to visit Bilbao and the Guggenheim Museum. It’s famous for its ground-breaking Frank Gehry architecture, but the art there is amazing as well. Oscar was excited to spot Jeff Koons' Puppy outside of the museum, which is made of live flowers held in shape by an underlying wire lattice. While Koons is having his retrospective in NY, we are in Bilbao with his puppy. Inside, there was a great installation by Jenny Holzer with moving LED words that were first in English and then in Spanish. The back wall was painted with a reflective paint, and the backs of the black strips had more moving words, but they were in Basque. Very site-specific, this installation! We also loved the Richard Serra sculpture. His work is always impressive, but I have never seen this particular body of work in a space that was so accommodating and which lent itself so completely to the artworks' success. Ellen booked her apartment through Airbnb. For families spending only a few days in San Sebastian, the best hotel is the Maria Cristina, located a short walk from the beach and the old town.